With Kavanaugh dominating the news, 2020 developments fall by the wayside of course. But re-election season will be upon us before we know it. And by soon, I mean, as soon as Election Day 2018 is over. There is a mixture of panic and hope concerning Hillary Clinton. Will she toss her hat in the ring again? Some say she will, as she has the money, name recognition, access to ace political operatives, and a renewed and energized Democratic base that is viciously anti-Trump. Now, a lot of liberals are also sick of her. 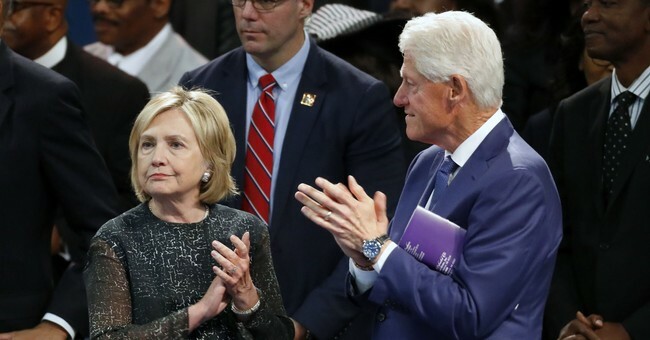 She’s a two-time loser, she had her chance, the Clinton chapter on American politics is at an end, and the lurch to the left is a sign that the base wants a fresh (and more left wing) start. Still, some folks think she has a solid chance to make a third go at the Oval Office. Democratic pollster Molly Murphy said on Friday that 2016 Democratic presidential nominee Hillary Clinton still does not have the support needed to win a presidential election, referencing a recent American Barometer survey. "I think that what that poll shows is that neither one of those candidates are even within a couple of points of 50 percent," Murphy, a partner at ALG Research, told Hill.TV's Joe Concha on "What America's Thinking." "I think that the  percent or so that said they supported Hillary Clinton, that's not enough to get you reelected. I think that that's people who liked Hillary Clinton who still like her, and still would vote for her again. The passage of time is unlikely to change that," she continued. "People can make their decisions on whether they like her or not, I just don't think they're changing their mind in terms of how they would have voted," she said. Murphy was referring to a recent American Barometer poll, which found that 44 percent of voters said they would vote for Clinton if the 2016 presidential election were to be held again. So, maybe this idea from the depths of hell won’t be resurrected. Then again, a Trump-Clinton rematch…that’s enticing.